St Joseph’s Celebrates a Hat Trick! 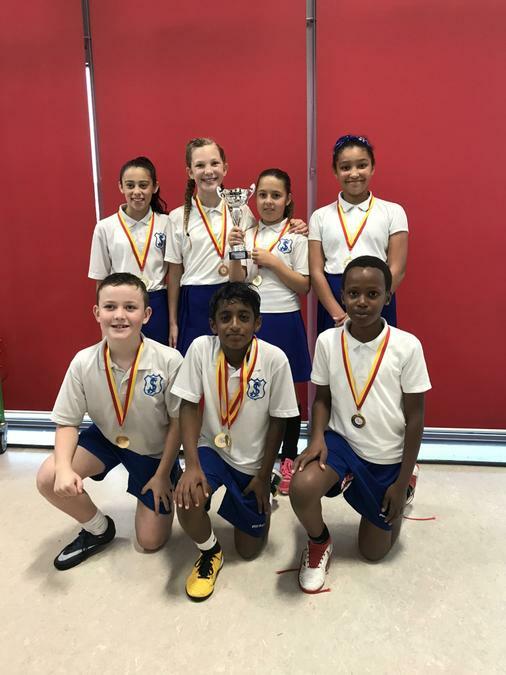 The St Joseph’s Catholic Primary School netball team was celebrating this week after winning the Thanet Passport Netball Cup for a record breaking third consecutive year. With the pressure of retaining the double crown on such young shoulders, the seven strong team drawn from Years 5 and 6 showed a fine grasp of netball strategy, impeccable technique and quick reflexes under pressure as they won game after game, demolishing 3 opponents until the battle lines were drawn against St Peter’s Junior School in a nail biting final. With much vocal support court-side, the St Joseph’s team kept their manager, Mr Jones, on tenterhooks as the balance of play tilted between both of the determined and skillful teams. Eventually the deadlock was broken and St Joseph’s won 1-0 in an impressive last flourish finish to an exciting finale. Alex, our rock as Centre, was awarded star player of the Tournament by the judges.